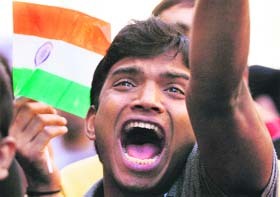 Chanting 'Vande Matram' and 'Bharat Mata Ki Jai', hundreds of Indian students today rallied in Sydney to protest against a spate of racial attacks and demand justice for victims, hours after another youth from the community complained about his newly-bought car being torched outside his home here. A protester shouts slogans in Sydney on Sunday. The Pakistani authorities did not produce any evidence to link JuD chief Hafiz Mohd Saeed to the Mumbai terror attacks, the Lahore High Court has said in its detailed judgement, days after he was set free by the court. Two policemen were killed and four injured when a suicide bomber blew himself up outside the emergency police centre in the G-8 area in the heart of the capital on Saturday. The bomber, believed to be a young man, initially tried to enter the main building but finding it heavily guarded, he scaled it rear wall and jumped into the building. Another close aide of Dawood Ibrahim, Arif Hossain, was arrested by Bangladesh police on Sunday. Hossain was nabbed this morning from Bosila area. An Indian national, he told police that he had received 1.5 lakh takas from Chhota Shakil, second-in-command of Daud Ibrahim’s gang, to clear legal expenses of one Mohammad Zahid’s case. The US does not intend to “meddle” in the Kashmir issue, but will support any effort by India and Pakistan to reduce their tensions, a key aide to President Barack Obama says while pressing Islamabad to take the “first step” to bring to justice the Mumbai attack masterminds. A middle-ranking Bangladesh Rifles (BDR) official has admitted to leading the mutiny by the border guard troopers in February this year that left 81 persons, including 55 Bangladesh army officers dead, a media report said today. 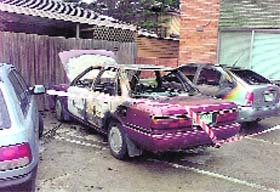 The rally, which demanded justice for the victims of racial attacks, came hours after yet another incident targeting Indian students in Australia came to light here in which a car belonging to a 22-year-old youth from the community was torched. Ratan, who hails from Ludhiana, said that two other cars, also belonging to Indians, that were parked next to his vehicle, were also damaged during the incident. "We were sleeping when it all happened. We heard the fire alarm of the car. When we went out to see what happened we saw the car on fire," he told PTI. He suspected that it could have been done by a group of drug addicts who used to sit near the premises. "I believe they (addicts) probably first tried to open the car. Then they may have used a petrol can to set it ablaze." Ratan, who came here a month ago to pursue a certificate course in Automotive Engineering, said that there was no chance of a short circuit that could have burnt the car in this cold weather. “The Attorney General contended that the petitioners are being blamed to be involved in Mumbai attacks, we have observed that not a single document has been brought on record that the petitioners are involved in it,” the court ruled. A three-member full bench of court yesterday in its detailed verdict maintained that “no documentary or any other evidence” was produced against the detention of Saeed and others. The court, in its 29-page verdict, observed the detainees were not informed regarding reasons of their detention within the period of three months which was a legal requirement. Saeed, linked to 26/11 Mumbai terror attacks, was set free on Tuesday by the Lahore High Court, triggering an angry response from India which accused Pakistan of not being serious about fighting terror. The 59-year-old Jamaat-ud-Dawah chief Saeed, who has been under house arrest since December 11, was ordered to be released by the High Court which held his detention as illegal. A close aide of Saeed, Col (retd) Nazir Mohammad, also held in connection with the November 26 attacks in Mumbai, was freed alongwith the JuD chief by the High Court. According to the judgment, Pakistan’s Attorney General and Advocate General made verbal request for in-camera proceedings as they wanted to produce some “secret” material to be in possession of the government against the petitioners. Two policemen were killed and four injured when a suicide bomber blew himself up outside the emergency police centre in the G-8 area in the heart of the capital on Saturday. The bomber, believed to be a young man, initially tried to enter the main building but finding it heavily guarded, he scaled it rear wall and jumped into the building. “The guard on duty opened fire at him at which he blew himself up causing a big explosion,” city police chief Bin Yameen said. Two policemen were killed, while four were injured. Bin Yameen said limbs of the bomber were recovered from the scene. “The police guards were alert and checked the attacker in time that averted a major disaster,” he said. Security arrangements in the capital have been tightened in Islamabad following the huge blast in Lahore on May 16 in which the provincial headquarter of the Inter Services Intelligence (ISI) was targeted. As manya s 29 persons were killed in the attack. Police told reporters that Arif is accused in several murder cases in India. He was freed on bail in 2000. He fled to Bangladesh the following year and later married a Bangladeshi national. A week ago, the policer had arrested a key associate of D-gang Ibrahim Merchant and his two associates — Zahid Sheikh and Mohammad Kamal. Their interrogation led to Arif’s arrest. Ibrahim is said to have told cops that Daud Ibrahim has around 150 operatives in Bangladesh, including 20 women, who are setting up his crime network in the country. Meanwhile, all four accued have been remanded in police custody forn seven days. Allaying apprehensions in some quarters in India that US Special Envoy to Afghanistan and Pakistan Richard Holbrooke’s mandate may also include Kashmir, Bruce Riedel, who co-chaired the inter-agency committee which formulated the Af-Pak policy, said: “I do not think, the Obama administration intends to meddle in Kashmir”. Deputy Assistant Director Touhidul Alam yesterday confessed before a Dhaka magistrate to have planned and led the mutiny, and all the operations during the carnage, The Daily Star said.